Seasonal Content & Promotions: Keep up with holidays and what's happening year-round. Offer timely content and promotions on a regular basis. Coupons: Coupon codes are a great way to draw in new customers. Get promo codes from the product owner. Free Samples and Trials: Let potential buyers experience and taste the product before buying. Free samples and trials tend to always be winners. Live Teleseminars/Webinars: Schedule content-rich events that promot your affiliate products. Aduio Recordings: Whether it's an interview or just content-rich recordings, create audios and give them away free. Videos: Create a variety of types of videos from interviews,to instructional, screen capture videos and product walkthrus. Interviews: Interview the product owner/creator. Get the owner of the product to provide useful content and answers to the common questions about product. Product Revies: Create product reviews with product specifications, quotes from customers and more. Special Reports: Take content a bit further and create short special reports that you give away free. Brand your document with your affiliate link. Blog Posts: Along the same lines as an article a blog post can be a bit more personal and friendly in nature. Articles: Targete articles that include your product as part of the solution to a problem can be very effective for sales. Twitter Tweets: Everyone's tweeting these days. Give a little blurb promotion (up to 140 characters, with spaces). Remember to leave room for your affiliate link too. Hint: Use the headline from the salesletter. Pay-Per-Click Ads: Leverage Google AdWords, Facebook Ads and Facebook Mobile Ads as well as other Mobile Ad Networks like AdMob. Short Text Ads: Provide short text blurbs in email and blog content. Banners and Graphics: Use a variety of sizes for your best converting affiliate offers. Also, help your readers by updating the graphics seasonally or for specific promotions automatically. Landing pages for different audiences: Target your affiliate landing pages as much as possible. Inline Text Links to Products and Specific Pages: Make it easier for your readers of html emails and blogs click directly to your affiliate offers. 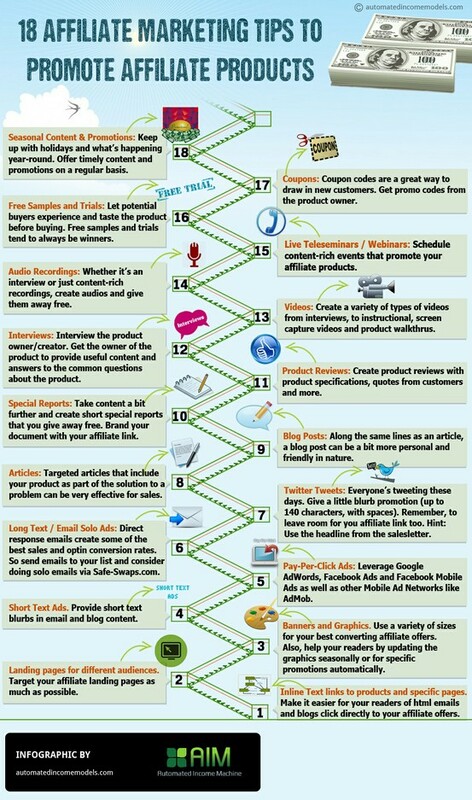 If you are doing affiliate marketing, then check out these 18 Affiliate Marketing Tips To Promote Affiliate Products. 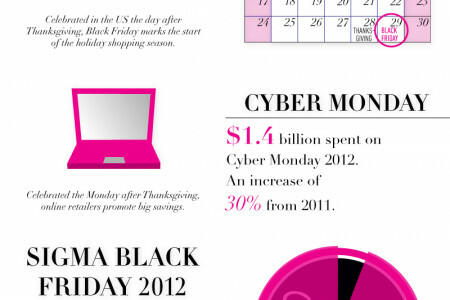 This infographic is presented by http://www.AutomatedIncomeModels.com Infographic...	Transcript 1. Inline Text links to products and specific pages. Make it easier for your readers of html emails and blogs click directly to your affiliate offers. 2. Landing pages for different audiences. 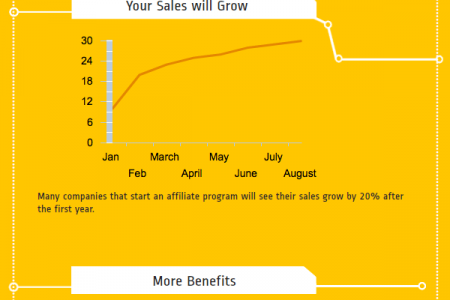 Target your affiliate landing pages as much as possible. 3. Banners and Graphics. Use a variety of sizes for your best converting affiliate offers. Also, help your readers by updating the graphics seasonally or for specific promotions automatically. 4. Short Text Ads. Provide short text blurbs in email and blog content. 5. Pay-Per-Click Ads: Leverage Google AdWords, Facebook Ads and Facebook Mobile Ads as well as other Mobile Ad Networks like AdMob.